Start by creating rainbow stripes using paper filling in the basket. 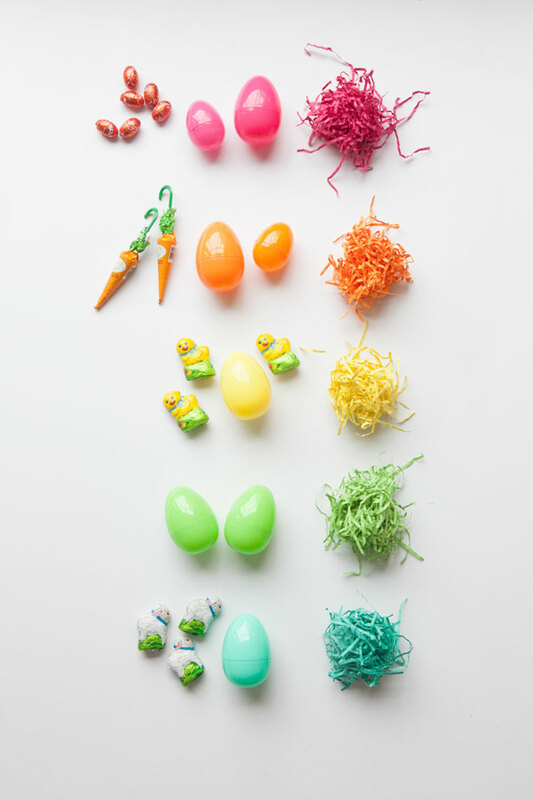 Top each stripe with eggs and candy in matching colors. Measure out ribbon in rainbow colors that match the paper filling stripes in the basket. Tie all the ribbon together in a bow on the top handle of the basket. Start by making at least 20 paper flowers in different sizes (here is our favorite tutorial) Add 3-4 leaves to each flower to add greenery. Starting with the bigger flowers, curl the wire stems around the basket handle and down the side of the basket. Fill in any gaps with smaller flowers. 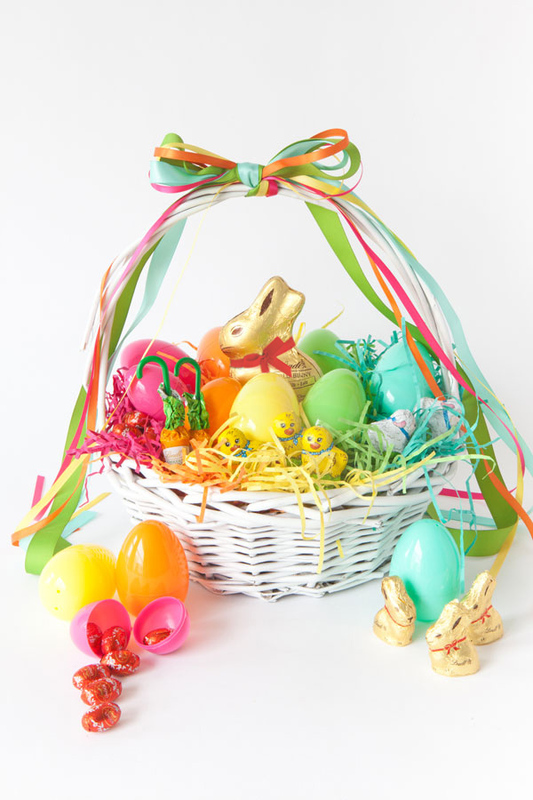 I always add ribbon to my easter baskets. 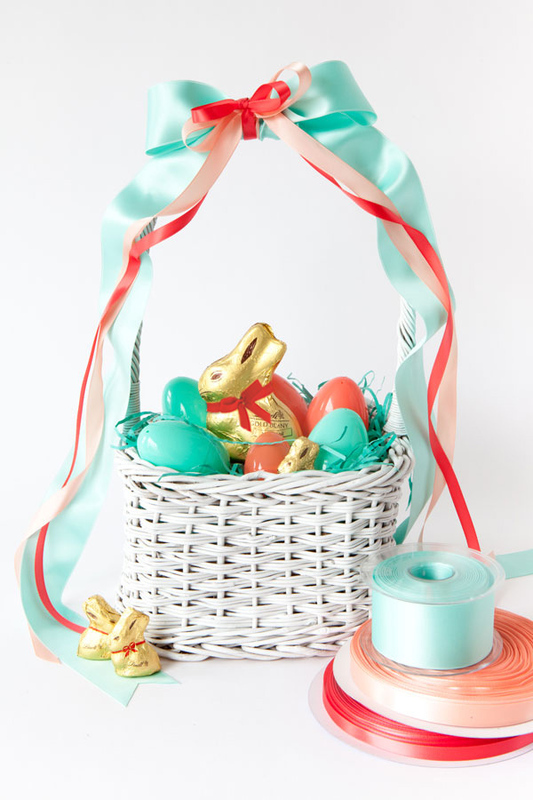 Choose a thick satin ribbon and tie it to the top handle of the basket. Choose a smaller satin ribbon and tie it on top of the thick satin ribbon. Use glue dots or double-sided tape to attach it down the side of the handle. This post is sponsored by Lindt: Master Swiss Chocolatier since 1845. These are beautiful but I love the flowers basket the best. I’d be afraid to hand it to my child after spending all that time on flowers, ha! Wow, these baskets are absolutely adorable! I really love the colours and the ribbons. Beautiful!!! The paper flowers are beautiful! Such beautiful baskets! So colorful, fun and sweet! I like the flower basket the best, but they are all so sweet! So cute! I made similar baskets like these but with wooden nests last year. I love adding flowers. and I think the matching shredded paper is a great idea! Ah! The paper flowers are it! 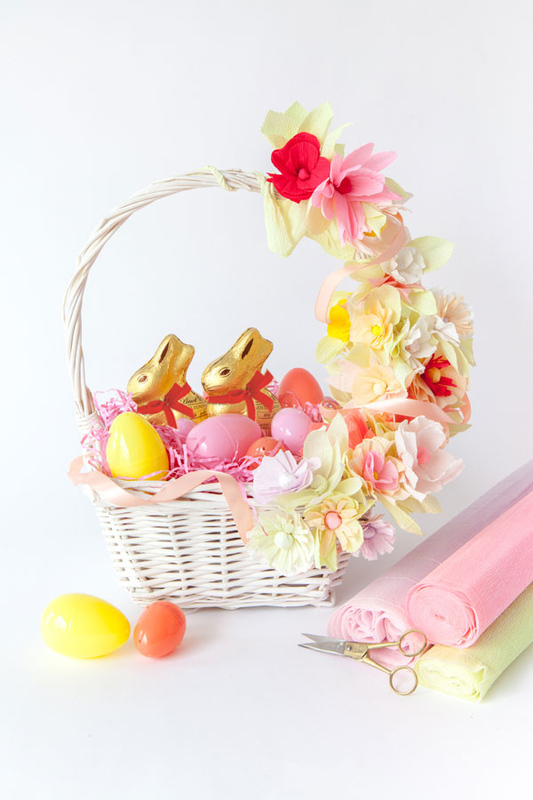 We’re going to be at Disney World during Easter & we thought about skipping the whole Easter basket thing since all of our money is going to Disney….but with all this Easter basket inspiration, I just might reconsider that decision!! How adorable are these! Lovely home decoration! Wow, these look so cute! Looking forward to Easter! Gorgeous basket inspirations! Thank you! I’m soooo excited for Easter! and Lindt bunnies are the only thing on my wishlist!! I absolutly love the white basket with flowers! Thanks for sharing!